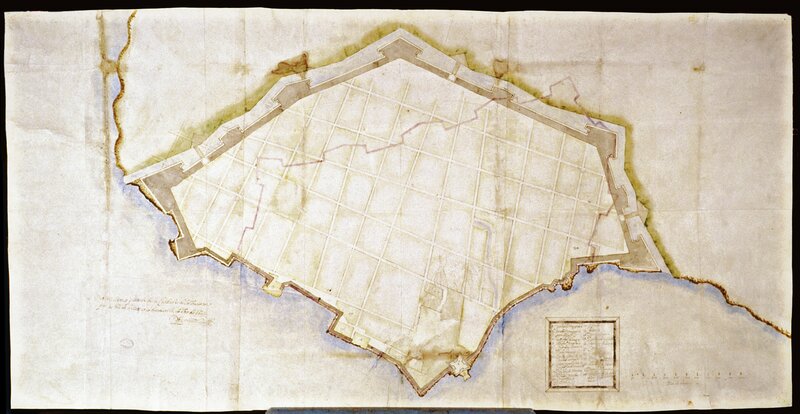 This map shows a plan to build a walled fortification around the port city of Havana, an attempt to make it less vulnerable to pirate attacks. Made by one of a family of Roman engineers, it bears witness to the international character of architecture. This map of Havana is oriented to the south at top. The bottom points to the entrance to the Bay of Havana. The mapmaker, Cristóbal Roda, shows only its southwest side, where the city of the Havana lay. The northeastern side of the bay, where the fort of Castillo de los Tres Reyes del Morro would be built, is not shown. Roda’s plan for fortifications called for a deep moat around the city wall, seen at the top of this map, with three bridges leading to its entrances. The angled sides of the wall's bastions allowed marksmen to protect the city from a land attack. The faint red line within the city represents another proposal for a wall. Despite the need, fortifications were not finished until late in the 17th century. 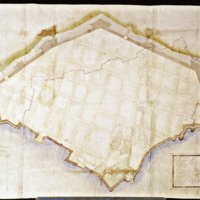 The map’s maker was one of a family of Roman architects in the employ of the Spanish crown. Cristóbal Roda worked with his better-known brother-in-law, Battista Antonelli, to designed fortifications in Havana including Castillo del Morro. They also worked in Cartagena, another important port in Spanish America. The map is a pen and ink drawing. It measures 23 x 45 inches (58.1 x 114.2 cm). Given the riches contained by the fleets coming in and out of Havana, fortifications like the one planned here were crucial architectural works. The crown not only commissioned them and named their architects, it financed their construction as well. This particular work is just one of the many fortresses planned in Spanish America. The skills of military engineers and architects were in heavy demand in the Caribbean, and the resulting constructions were a boon to local economies. The crown subsidized fortifications, pumping monies in to port cities. And both men and women, slave and free, participated in their building. Angulo Iñiguez, Diego. 1942. Bautista Antonelli, las fortificaciones americanas del siglo XVI. Madrid: Hauser y Menet. Dym, Jordana and Karl Offen, eds. 2011. Mapping Latin America: A Cartographic Reader. Chicago: University of Chicago Press. Fuente, Alejandro de la del Pino and Cesar Garcia. 1996. “Havana and the fleet system: Trade and growth in the periphery of the Spanish Empire, 1550-1610.” Colonial Latin American Review 5 (1) 95-116. Scarpaci, Joseph L., Roberto Segre, and Mario Coyula. 2002. Havana: Two faces of the Antillean Metropolis. Chapel Hill: University of North Carolina Press.